Have you ever wanted to license your artwork on gifts, stationery and greeting cards? For the past twenty years, I have done exactly that–and now I’ve written a very fun book called License to Draw-How I built a Fun Career in Art Licensing and You can Too! about the ins and outs of the art licensing business. I wrote it in a friendly and readable style, so you’ll find inspiration, motivation and a step by step explanation of how to get your work published. You’ll also travel along my journey of how I went from a scribbling third grader to a successful artist with hundreds of products generating royalties! OMG!!! This is such a fun read! Ronnie is not only hilarious but she delivers practical industry advice in this book. How perfect is that? You will gain insights into a tough-to-define industry and have a good laugh along the way! 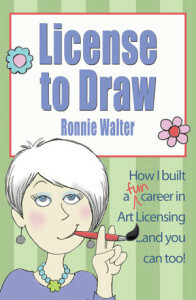 It’s important for artists learning about the art licensing industry to have a realistic view before diving in – Ronnie delivers that and more in a humorous and easy to read book chock-full of real-world stories and examples. If I had more thumbs I’d give her more than two thumbs up! I highly recommend this book! License to Draw is available on Amazon in paperback (so you can write all over the margins) or as an e-book (so you can switch between my book and War and Peace on the airplane), just click here to purchase. I thank you from the bottom of my heart! Click the book cover to purchase my book through Amazon!